Many trees and extreme elevation changes throughout. Good combination of long, open holes and short, accurate ones. Nice park with playground and city skyline views. From I-70/I-35 in the downtown loop, take Hwy 9 exit north across river, stay on Hwy 9 until Y in road, go right (Oak Trfwy). Park 0.5 mile, turn left across from Farmland Industries. 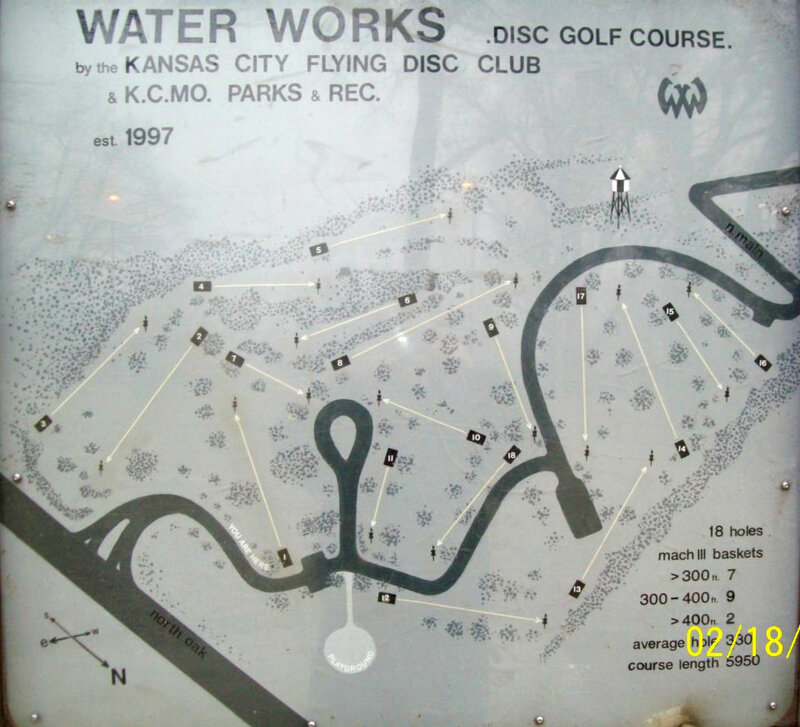 I heard that Water Works was the course to play in KC...I was not disappointed. This is by far my favorite course to date. The elevation changes and overall layout are stunning. This will challenge you, yet you find yourself in a state of peaceful focus as each hole heightens your anticipation of the next throw. I will play this course again and KC BBQ rocks. I was playing Water Works Park on Saturday after one of my traveling companions finished his semi final round at the 2009 World's. None of us had Water Works Park on the schedule so we were all pumped and ready to play, so much so that after arriving and pulling our cooler out so we could have lunch prior to playing, we ate, got ready to play and left the parking lot leaving the hatch open to our vehicle, complete with ALL of our winnings for the week, ALL of our belongings that ranged from laptops to a multitude of back-up discs and much more. When we returned to the parking we discovered that we left the vehicle totally open and unattended and were VERY thrilled to find that no one had even paid any attention to the car full of bootie, free for the taking. Thanks to those disc golfers that frequent WWP. Now for my review, I LOVED IT BEYOND WORDS so I'll quote the words of my friend that I played with, a friend that is a pastor at a local Lutheran church. He said "this is like God placed a disc golf course here and the land just had to wait for the game to become popular and the designer to come along and place the pins and tees. Not much else that I could add to that description except make sure to visit Water Works Park and if in going to WWP you pass Cliff Drive, make sure to stop there before or after.